BMW has had the same tagline for 50 years: “The Ultimate Driving Machine.” It’s a relative term, and for good reason. Just ask Ludwig Willisch. The way he sees it, BMW must continually work to understand this modern balance between athleticism and asceticism. Or die trying. 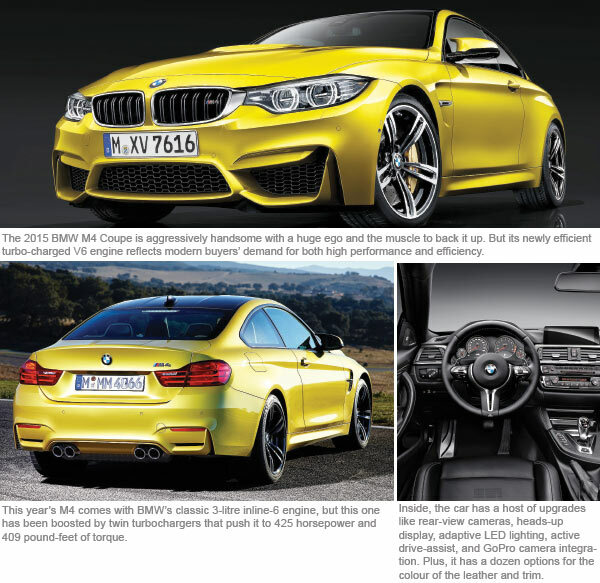 The concept appears no more clearly than in the 2015 BMW M4 I drove two weeks ago around New York. The coupe is aggressively handsome with a huge ego and the muscle to back it up. But its newly efficient turbo-charged V6 engine reflects modern buyers’ demand for something that driving machines decades ago didn’t have to provide: high-performing efficiency. Even better, it has that alluring gravitas inherent in most cars of the marque. If Daniel Craig were German, he’d be the M4 — unsmiling, businesslike, and fit to perfection in a tailored dark suit. Deliberately reserved, this car is lethally efficient. Most modern sports cars seem to smile, snarl, and/or seduce when they approach. This does none of that. It’s a machine you see only when it wants you to. And by then it’s too late. I drove the US$64,200 (RM215,712) M4 at the peak of autumn. First I took it with friends to brunches, and then whipped it alone around the southern tip of the island where, late at night, you have the highway and the sound-enhancing tunnels all to yourself. It had a lot to live up to. This is the vehicle that replaces the well-loved M3 Coupe — BMW now makes the M3 only in four-door form — in the brand’s esteemed M performance line. These are the best cars BMW makes, period. The M4 is no exception. Under city and highway conditions, it performed with sniper precision and prize-fighting aggression. And despite its annoying stop-start function and a whiff of turbo lag, it proved its worth. This year’s M4 comes with BMW’s classic 3-litre inline-6 engine, but this one has been boosted by twin turbochargers that push it to 425 horsepower and 409 pound-feet of torque. That is impressive considering that the preceding M3 Coupe had a 4-litre V8 that also got 425 horsepower, but reached only 295 pound-feet of torque and was way less efficient. In fact, the M4 has managed to avoid the gas-guzzler taxes that add on thousands of dollars to thirsty cars, thanks to its 17 city/26 highway fuel efficiency. The engine had a lot to do with the improvement, as did weight-saving measures like the carbon-fibre reinforced plastic that comprises the rooftop and the 24lbs (11kg) lighter transmission. All told, the M4 is 180lbs lighter than the M3 Coupe. There is a particular feel to the engine. I have read other reviews of the M4 that claim it performs like a finely tuned weapon. This car performs supremely, but it’s incorrect to say that there’s not even the faintest hint of hesitation when you accelerate quickly. Try punching the gas around a curve or on the hill passing over a bridge. You can feel the difference in engine type. The other side of the efficiency story with this car is the fuel-saving start-stop function that deadens the car when it comes to a standstill. It helps improve efficiency by double digits. But for me, it gets in the way of enjoying the car. I just don’t like the feel of it dying on me at every light. BMW has done much to allow the M4 plenty of room to run on the track. In addition to the power upgrade in the engine, it has a tightened suspension, variable stability control settings and three different steering modes (comfort, sport and sport plus) that allow input from the car to be adjusted based on the driving conditions and a driver’s own preference. Two words about the suspension: It’s stiff. Not as horrible over cobblestones and potholes as, say, a Ferrari F12. But it’s not going to coddle you, either. Don’t buy this as some sort of compact cruiser. It’s not. The M4 has the same kidney grills and punchy nose as its brethren; its body lines draw the eye cleanly, swiftly, from the front to the rear. The hood has subtle ridges down the front. Inside the M4 comes with a rear seat conducive to two adult males of average height, and the dash is satisfying, with uncluttered superfluous buttons. It also has a host of upgrades (rear camera, heads-up display, adaptive LED lighting, active drive-assist, GoPro camera integration). Plus, it has a dozen options for the colour of the leather and trim inside. Not to mention the M Performance catalogue of options like a front-splitter, matching side skirts and a rear spoiler made of carbon. You can’t bespoke this car, but the personalisation potential is satisfactory. This article first appeared in The Edge Financial Daily, on November 24, 2014.